Oxymorphol is oxymorphone which has been hydrogenated at the 6-position and consists of a mixture of 4,5α-Epoxy-17-methylmorphinan-3,6β,14-triol and 4,5α-Epoxy-17-methylmorphinan-3,6α,14-triol (hydromorphinol). . 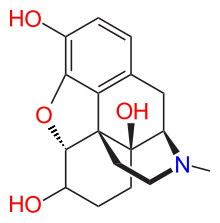 It is produced by the human body as an active metabolite of oxymorphone and some bacteria as an intermediate in turning morphine into hydromorphone. It can also be manufactured and is the subject of patents by drug companies looking for new semi-synthetic analgesics and cough suppressants. A derivatve of oxymorphol, 8-hydroxy-6-α-oxymorphol, was discovered in the first decade of this century and the subject of a patent application by Endo for an analgesic and antitussive.